This post is the fourth in our Neighborhood Studios blog series to share the journeys of seven people who have participated in Neighborhood Studios, the Greater Hartford Arts Council’s summer apprenticeship program for teens. 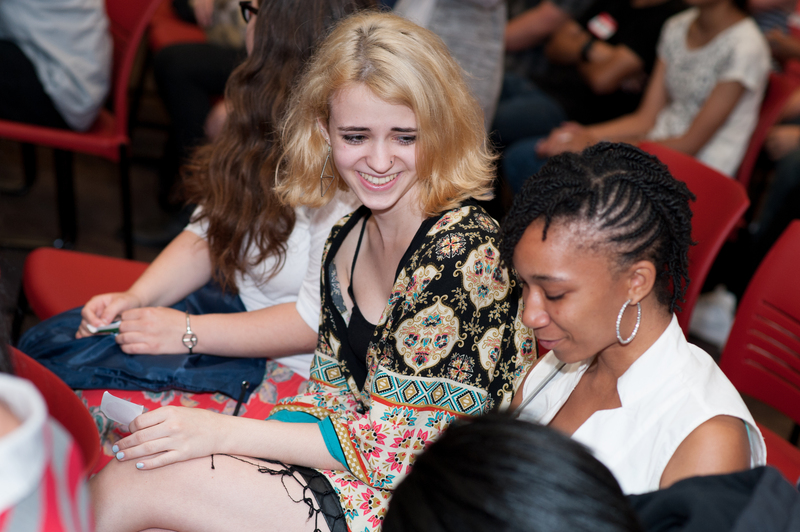 Each one of their stories is a different perspective on the way this program can shape you and prepare you for your future career, college, and a life that’s connected to the arts. Each post will highlight a specific skill they gained or growth they experienced as an apprentice, as a teacher, or as a staff member. Today we’ll meet Poppy. Poppy was a Neighborhood Studios apprentice in 2015 when she participated in the Mark Twain House’s Write to the Point creative nonfiction writing studio. Poppy assisted the Greater Hartford Arts Council by participated in an apprentice brainstorm to help plan the 2016 summer of Neighborhood Studios. For the past four years, I have attended the Kingswood Oxford School in West Hartford, Connecticut. The school itself is wonderful, and encourages its students to broaden their horizons and embrace diversity. However, due to the school’s location and tuition fees, many of my classmates share the same story. The majority are quite privileged, and frankly fit the mold of cliché prep-school student. When I was accepted into the Write to the Point program at the Mark Twain House, I was unsure of what to expect, and my first day was somewhat of a culture shock. As I walked into the courtyard, I found myself surrounded by complete strangers, each scanning the room for a friendly face. Amidst a sea of getting-to-know-you games, we began to learn more about each other’s lives. As the course continued, we interviewed several of our peers in order to improve our journalism skills. I got to know people from different schools, towns and socioeconomic groups. Some had applied to the program in order to improve their college essays while others pursued lifelong dreams of becoming a successful journalist. One of the things that surprised me most was how my peers planned to spend their paychecks. While I had planned to spend the money on frivolous things, several of my classmates were giving up at least part of their money to assist their families. The Neighborhood Studios program provided a reality check for those of us who had forgotten our privilege. The program showed me how truly alike we all are, even living in a time where so much emphasis is placed on our differences. Experience Neighborhood Studios for Yourself! Apprentices must be between the ages of 14-18 and reside in the Greater Hartford Arts Council’s 34-town service area. Additional eligibility requirements are listed in the Apprentice Guidelines. Neighborhood Studios applications are due by April 29, 2016. Apprentices will be selected and notified by the end of May. Part 1: See how the Knowledge Brandon gained in Neighborhood Studios has helped his career in the arts and beyond. Part 2: Learn how Molly gained Independence through Neighborhood Studios. Part 3: Read about how Stacey witnessed Self-expression and Self-reflection in the Amistad Center’s SNAP! Photography studio. Part 4: Find out how Poppy gained Perspective while participating in the Mark Twain House’s Write to the Point studio. Part 5: Learn why Sten’s most important Neighborhood Studios experience was all about the Truth. Part 6: See how Daisy built a connection with her audience while Performing in Breakdancing Shakespeare at Hartford Stage’s Neighborhood Studio. The experience of Neighborhood Studios aligns with the Common Core’s description of students who are college and career ready in Reading, Writing, Speaking, Listening, & Language. Additionally, all Neighborhood Studios align their work with the Common Core State Standards as well as the National Core Arts Standards.